Stay 5 nights or more at Mahali Mzuri, Sir Richard Branson's Kenyan Safari Camp during September & October 2013 and receive your final night FREE! For arrivals during the 2013 high season from 1st September until 19th October, when you book to stay for a minimum of 5 nights on safari at Mahali Mzuri in Kenya your last night will be free of charge! This offer is based on our high season rate of US $995 per person per night. Our rates include accommodation, all meals and drinks, high quality wines and champagne.  Daily game drives and game drives at night in 13,500 hectares! FREE night opening offer (4for3) at Sir Richard Branson's Kenyan Safari Camp, Mahali Mzuri. For arrivals from 1 August until 31 August 2013, book to stay a minimum of 4 nights and receive your last night free! This offer is based on our high season rate of US $995 per person per night and your final night will be free. A 4 night minimum stay applies. Mara Toto Camp is a brand new addition to the Great Plains Conservation Collection in the world famous Masai Mara Reserve, and will now be opening for 11 months of the year (closed for one month after Easter, each year). It complements Great Plains Conservation's existing Kenya products - Mara Plains Camp, ol Donyo Lodge and Ride Kenya horse safaris. Mara Toto is a magical revisiting of the past, drawing from the designs of original explorers and created for those who want to get a step closer to the romantic era of Kenya and East Africa. 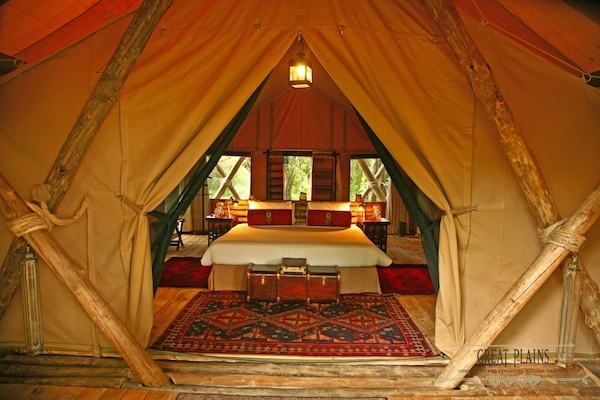 Under off-white canvas with shadows dancing against candle-lit tents, the camp is nestled in the cool shade of a grove of ebony trees on the banks of the Ntiakitiak River which cuts through the private Olare Orok conservancy. It is set down low, hidden from lights and noise and any sign of mankind. It is a time-capsule of an era when Finch Hatton, Barclay Cole and Delaware went on safari through these parts in search of adventure, romance and Africa’s big game. 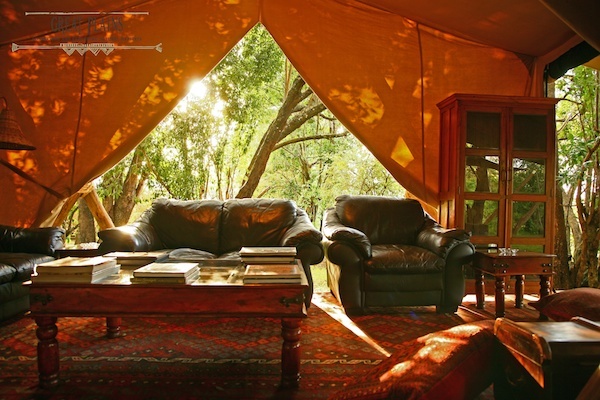 The five tents are large and spacious, light and airy, with en-suite toilet and showers where guests enjoy piping hot water from huge brass period showers while listening to hippos snort and grunt in the river below. Mara Toto is authentic safari chic, staying true to the language of the 1920’s with some of the best access to the Masai Mara as well as the Mara North Conservancy. Here guests will experience 4x4 vehicle safaris with qualified guides and the best of both worlds, the intense game action of the ecosystem and the quiet and stylish retreat of their own private haven. The camp is positioned to take best advantage of two migrations, the famous annual Serengeti migration and the second green season migration which brings in nearly half a million wildebeest and over 100,000 zebras playing the game of chasing storms for best grazing. The area is a predators dream! Mara Toto is a stylish experience and adventure camp that is head and shoulders above any other in the region, matching the service levels, specialised guiding, design and quality that has become associated with Great Plains Conservation. Great Plains Conservation is pleased to announce, on 28th January, the opening of its second camp in the greater Masai Mara ecosystem, Mara Toto Camp. Toto’ means baby in Swahili, and was often used as a term of endearment in reference to young safari staff in the days of early exploration. But today, in our context, it is simply meant out of respect to its sister camp, Mara Plains, which has developed a phenomenal reputation. We are certain Mara Toto will follow suit. Mara Toto positions itself squarely in the heart of magnificent predator country and is a place for the ardent safari-goer. Spend your days out – all day – exploring the 70,000 acre private Mara North Conservancy, or go in deep into the famous Masai Mara Game Reserve to catch the river crossings or a foray around Topi Plains. Shaded by the riverine forest the camp consists of five custom-designed tents of light-colored flowing canvas open on the horizontal side with canopied ceilings. En-suite shower tents including flush loos, bucket showers and plumbed water ensure utter comfort. Each of the tents is decorated with a nod to the style of early exploration and discovery – an eclectic, yet coordinated assembly of what early travellers may have carried, items such as brass chandeliers, old Indian chests, local natural materials. The whole aura is refreshing, speaking to romance and exploration. Keeping with the finest in the industry, each Mara Toto tent is kitted with the finest Swarovski Optik binoculars for guest use. A good news story to start 2013 from just before Christmas, watched over by Olympic champion and 800m world record holder, David Rudisha, and former 800m World Champion Billy Konchellah; The inaugural Maasai Olympic Games. There was a time when in order to prove their manhood and attract the girls a Maasai warrior had to kill a lion. Today, in the Maasailand of southern Kenya, Maasai groups do not hunt lion and instead compete against each other to high-jump, Maasai-style on the spot; throw spears (javelins); run 5000m and emulate Mo Farrah and doing the unorthodox Mobot move; throw their traditional rungu at targets; and sprint 200m and pull a lightning bolt celebratory pose. The rewards for the Maasai, other than finding potential mates, include sponsorship to train in Kenya's high-altitude training camp of Eldoret and then compete in the New York Marathon, win educational scholarships, a stud bull, and to meet their heroes and fellow Maasai David Rudisha, Billy Konchellah and Ruth Waithera Nganga. Wildlife flourishes and conservation tourism benefits all communities it operates in. Instead of hunting for lions these Maasai are competing for trophies of a very different sort, bringing respect, pride and esteem. "The Maasai Olympics is the first time I am aware of that the Maasai leadership of an entire region has proposed to take lion killing out of their warrior culture after 500 years, making it an actual taboo and providing athletics instead as an alternative warrior activity." On 22nd December Great Plains Conservation co-sponsored this hugely enjoyable event with the Big Life Foundation/Maasailand Preservation Trust in Kimana Wildlife Sancturary. We are proud to support initiatives like this and congratulate the Mbirikani Game Ranch, where Great Plains' ol Donyo Lodge is located, on winning the overall title against their competing Maasai neighbours. Congratulations too to all that took part to make this the first of many Maasai Olympics, a better option today and for tomorrow for the preservation of Maasai culture and the wildlife the Maasai live amongst. Expect many more Rudishas in the Rio 2016 Olympics. Click here to view video news coverage of the event. Whoa! We're so thrilled that Ride Kenya is featured all over the Tatler Travel Guide 2013 this month, including the front cover. Pick up your copy of January's Tatler, on news-stands now in the UK, and read the excellent feature highlighting the best eleven horse rides in the world. Ride Kenya opens the show through an excellent article complied by Daisy Finer and experienced first-hand (actually about 15 hands) by her mother, Hilary Finer, riding amongst wildlife beneath the snow-capped backdrop of Mount Kilimanjaro. 1.7 days/6 night Chyulu Hills safari itinerary. Unbeatable scenery and riding for strong intermediate to advanced riders. 2.8 days/7 nights Amboseli safari itinerary. Advanced and adventurous riders only. 3.NEW 11 days/10 nights Amboseli-Chyulu safari itinerary. Combining both the Amboseli Ride and Chyulu Hills ride. 4.Private tailor-made departures e.g. 4 nights itinerary. For private groups. The first four are fully-supported mobile rides with anything from 2-10 people on a ride. The latter is perfect for mixed-ability groups of riders and non-riders based at our newly accredited Relais & Châteaux lodge, ol Donyo Lodge. For the mobile safaris riders do have to be fit, competent jockeys, capable of keeping up a fair pace over uneven terrain. Expect to spend between 4 and 7 hours a day in the saddle. As well as riding there are plenty of opportunities to game drive, walk and to relax - giving sore behinds a rest after a thrilling day in the saddle. The Chyulu Hills safari costs USD4,500 per person sharing in 2013 (excluding flights). This includes a USD600 per person contribution to the work of the Big Life Foundation, which has recently merged with the Maasailand Preservation Trust, headed by Richard Bonham and Nick Brandt. Big Life does hugely important work with local communities and safe-guarding wildlife in the Chyulu Hills-Amboseli-Kilimanjaro region. We still have availability on the 19th January Amboseli departure for those seeking a week of excitement during what's otherwise the height of a cold British winter. Click on image below, or here, to read the rest of this account and see further images of ths incredibly rare experience in the Mara. Mara Plains Camp will now be open right through Christmas and New Year to the 7th January 2013, before it closes for an upgrade where it will then reopen on 1st June 2013. Mara Toto Camp will open from 17th January with five tents a mile downstream from the site of Mara Plains Camp.